Product prices and availability are accurate as of 2019-04-21 08:34:52 UTC and are subject to change. Any price and availability information displayed on http://www.amazon.com/ at the time of purchase will apply to the purchase of this product. This 30-Pc. 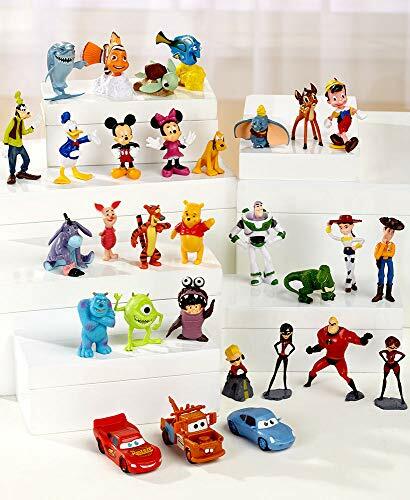 Disney Figurine Set brings all their favorite animated characters to life. They'll have an absolute blast joining their heroes on exciting adventures, whether they're at home, in the car or enjoying a weekend stay at grandma's. Includes classic characters, as well as those from The Incredibles, Monsters Inc., Toy Story, Finding Nemo, and Cars. Pieces range from 1/2"W x 1/2"D x 2"L to 2"W x 1"D x 2"H. PVC. For ages 3 and up.